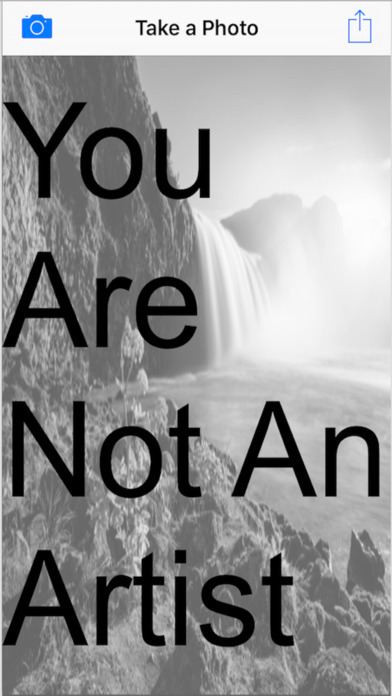 You are not an Artist. This app is worth nothing. It is just another commercial grab for money and attention. This is a meta-modern commentary on the post-modern debasement of art. Everything is not art. Adding filters and angles to your selfies and photos does not make you an artist. Art is meant to challenge and question established schools of thought. A core post-modernist belief is that everything is art. Therefore the logical reaction is that nothing is art. Express your evolving views by sharing your meta-modern photos with your friends. Take a photo, add a filter, and join the #NotArt movement by posting it to social media.